Details FOSSEE team at IIT Bombay organized an OpenFOAM Symposium. OpenFOAM is a Free and Open source computational toolkit comprising of several solvers and many utility application. Symposium was a user's meet which provided the opportunity to spread the use of OpenFOAM in industrial and academic community in India. The main objective of this symposium was to facilitate the interaction between the experts in the field of OpenFOAM and the beginners. 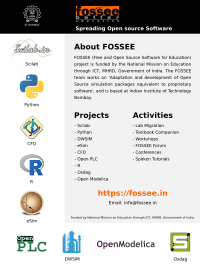 This would help to provide a common platform for students, academicians and industry for learning, understanding and contributing to the OpenFOAM Community in India.